ecently Windows Phone Nokia attacking ranks with some of the phones series Lumia. At the beginning of the year in Barcelona Finnish telecom brand promotes the cheapest and affordable a Windows based phone and it is precisely smartphone that will show you in my next video review. Dear viewers Digital.bg we are pleased to introduce you with detailed Nokia Lumia 610. Purely visual, it does not overlap with peers from the Durham family. On the other hand the price, now the country is just 300lv not make it less effective. Corps simple and effective, combining several materials and types of treatment. Color options are also few and increasingly spectacular – black, purple, pink, white and blue that we tested for several days. Mass of 132 g is within the normal range for a smartphone with dimensions 119.2 mm height and 62.2 mm wide. Thickness of 11.9 mm is also normal, but note that because of its rounded peripheral line with chrome edging, 610 looks much more compact. Display that Nokia has chosen to budget your Windolw Phone’s LCD 3.7-inch diagonal. It has a resolution of 800×480 pixels and 178 degree wide angle side mirror. When working in direct sunlight into account a slight glare, which can be related to training kompensiva to adjust the brightness of the screen. It can also receive automatic one with the ambient light sensor. Consider more proximity sensors and orientation. We personally would advise you if you buy the phone immediately and take screen protector. 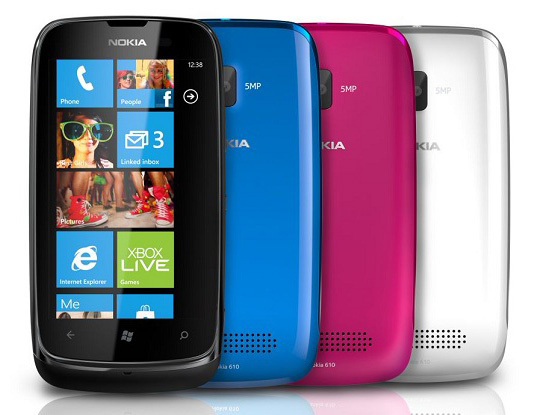 But if you forget, do not worry, Lumia 610 has Corning Gorilla Glass. Traffic on the capacitive screen is practical and realistic.